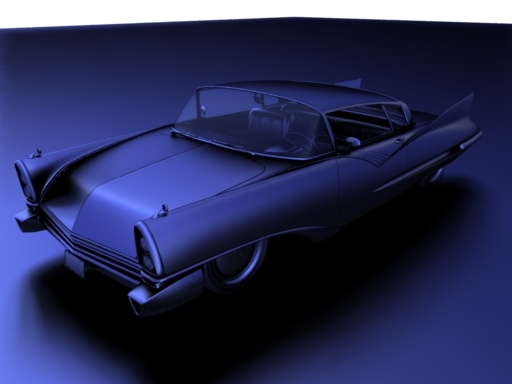 The purpose of this application note is to provide recipes and examples for computing point-based approximate ambient occlusion and color bleeding using Pixar's RenderMan (PRMan). The basic idea is to first bake a point cloud containing areas (and optionally color), one point for each micropolygon, to create a point-based representation of the geometry in the scene. Each point is considered a disk that can cause occlusion and/or color bleeding. For efficiency, the algorithm groups distant points (disks) into clusters that are treated as one entity. The computation method is rather similar to efficient n-body simulations in astrophysics and clustering approaches in finite-element global illumination (radiosity). 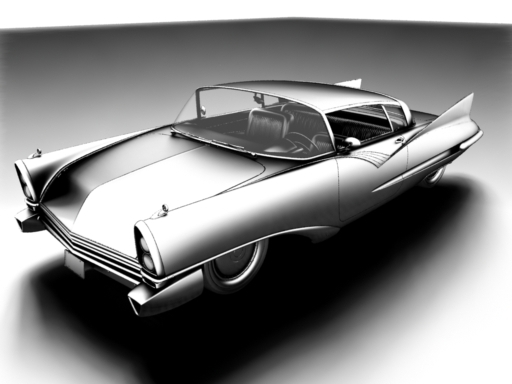 Some of the implementation details also resemble the subsurface scattering method used in PRMan's ptfilter program. 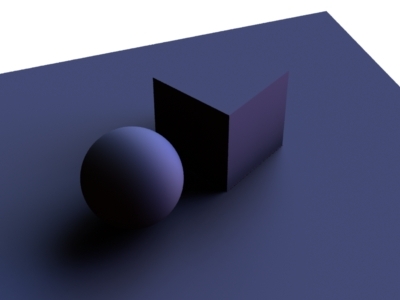 The geometric primitives do not need to be visible for ray tracing; this can significantly reduce the memory consumed during rendering. Computing (HDRI) environment map illumination is just as fast as computing only occlusion. 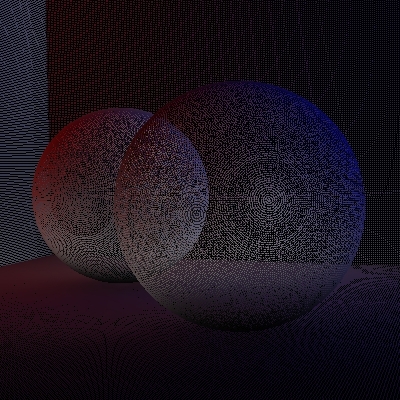 Displacement mapped surfaces take no more time than non-displaced surfaces. Efficient point and octree caches mean that only a small part of the data need to be kept in memory. It runs on standard CPUs - no special hardware required. The area (and optionally color) point cloud has to be generated in a pre-pass, making this a two-pass approach. The algorithm is not as accurate as ray tracing and should not be used for perfectly specular reflections and refractions. Computing approximate ambient occlusion requires two steps: 1) generating a point cloud with area data; 2) rendering using the occlusion() function to compute point-based approximate ambient occlusion. Surface "bake_areas" "filename" "foo_area.ptc" "displaychannels" "_area"
Rendering even complex scenes with this simple shader should take less than a minute. The number of baked points can be adjusted by changing the image resolution and/or the shading rate. It is often sufficient (for good quality in the next step) to render with shading rate 4 or higher. This shader reduces the area of points on semi-transparent surfaces so that they cause less occlusion. (If this behavior is not desired, just comment out the line in which the area is reduced by the opacity.) The opacity could of course come from texture map lookups - instead of being uniform over each surface as in this shader. The parameters "hitsides", "maxdist", "falloff", "falloffmode", "samplebase", "bias", and "maxvariation" have the same meaning as for the standard, ray-traced ambient occlusion computation. (Note, however, that using "falloff" 0 with a short "maxdist" gives aliased results. We hope to overcome this limitation in a future release.) There will always be a quadratic falloff due to distance; the "falloff" parameter only specifies additional falloff. The "samplebase" parameter is a number between 0 and 1 and determines jittering of the computation points. A value of 0 (the default) means no jittering, a value of 1 means jittering over the size of a micropolygon. Setting "samplebase" to 0.5 or even 1 can be necessary to avoid thin lines of too low occlusion where two (perpendular) surfaces intersect. 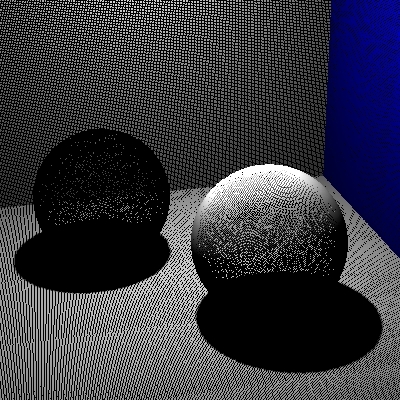 The "bias" parameter offsets the computation points a bit above the original surface. This can be necessary to avoid self-occlusion on highly curved surfaces and along convex edges. Typical values for "bias" are in the range 0 to 0.01 (depending on the scene size). The point-based occlusion algorithm will tend to compute too much occlusion. The "clamp" parameter determines whether the algorithm should try to reduce the over-occlusion. Turning on "clamp" roughly doubles the computation time but gives better results. For production-quality rendering, turning on "clamp" is highly recommended. The "maxsolidangle" parameter is a straightforward time-vs-quality knob. It determines how small a cluster must be (as seen from the point we're computing occlusion for at that time) for it to be a reasonable stand-in for all the points in the cluster. Reasonable values are in the range 0.03 - 0.1. Implementation detail: The first time the occlusion() function is executed (with the "pointbased" parameter set to 1) for a given unorganized point cloud file, it reads in the point cloud file and creates an octree. Each octree node has a spherical harmonic representation of the directional variation of the occlusion caused by the points in that node. If the point cloud file is organized, only the file header is read initially and the points and nodes are read on demand and cached - organized point clouds are discussed in further detail below. 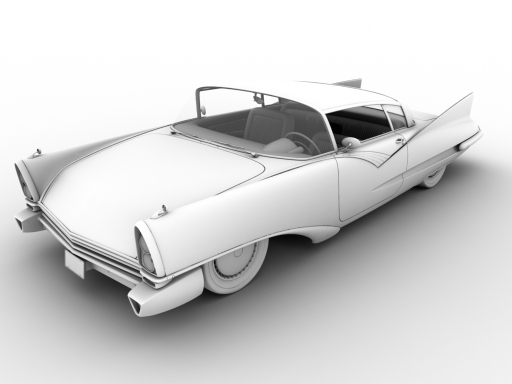 Generating the area point cloud takes about ten seconds on a standard multi-core PC, and computing (and rendering) the point-based ambient occlusion takes about one minute. 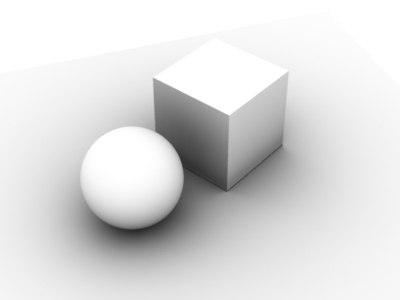 Keep in mind that the point-based ambient occlusion values are (by their very nature) not exactly the same as the ambient occlusion computed by ray tracing. However, the point-based occlusion has much of the same "look". 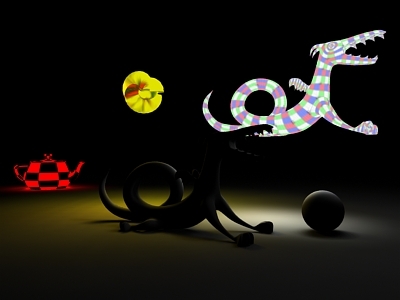 It is often necessary to try different combinations of "hitsides", "maxdist", "falloff", "falloffmode", "clamp", and "maxsolidangle" to get an occlusion result that closely resembles ray-traced ambient occlusion. For high-quality results we recommend "hitsides" "both", "clamp" 1, and "maxsolidangle" at most 0.05. Experiment with different settings for bias - typically values in the range 0.0001 to 0.01 are good (depending on the scene size). Another issue that can require some fine-tuning can occur where two surfaces intersect. Sometimes a thin line with too little occlusion can be visible along the intersection. To avoid this, set the "samplebase" parameter to around 0.01, "hitsides" to "both", and "clamp" to 1, and experiment with different values for the "bias" parameter. The environment direction (the average unoccluded direction, also known as "bent normal") can also be computed by the occlusion() function with the point-based approach. Just pass the occlusion() function an "environmentdir" variable, and it will be filled in - just as for ray-traced occlusion() calls. The environment directions will be computed more accurately if the "clamp" parameter is set than if it isn't. 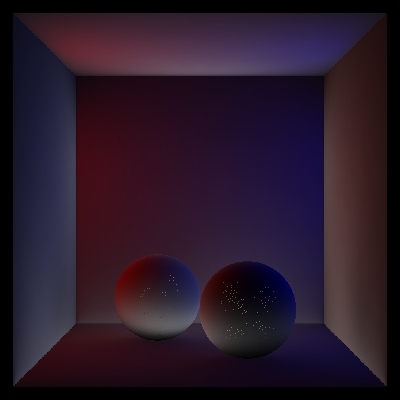 Environment illumination, as for example from an HDRI environment map, can be computed efficiently as a by-product of the point-based occlusion computation. The environment colors are computed much more accurately if the "clamp" parameter is set than if it isn't. 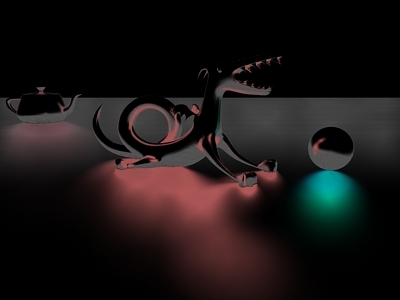 Either way, computing point-based environment illumination takes nearly no extra time when point-based occlusion is being computed. Reflection occlusion is a popular way to figure out where the reflections are in a scene. At the points with no reflection it is common to look up in a reflection map or environment map. Reflection occlusion is usually computed by tracing rays in a (narrow) cone around the main reflection direction. However, it is also possible to compute reflection occlusion with point-based techniques - as long as the cone is not too narrow. To get sufficiently accurate reflection occlusion results, the maxsolidangle parameter has to be set to very low values. In this example, we have used a maxsolidangle value of 0.005. (In PRMan 15.0 and higher, we also recommend increasing the rasterresolution parameter from its default value of 12 to 20 or even 30.) The images below show two examples with coneangle 0.4 and 0.2 radians, respectively. Here is an example for more complex geometry. 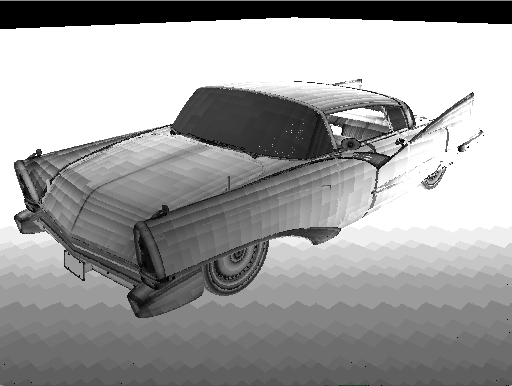 The figure on the left below shows a car with pure point-based reflection occlusion (coneangle 0.3). 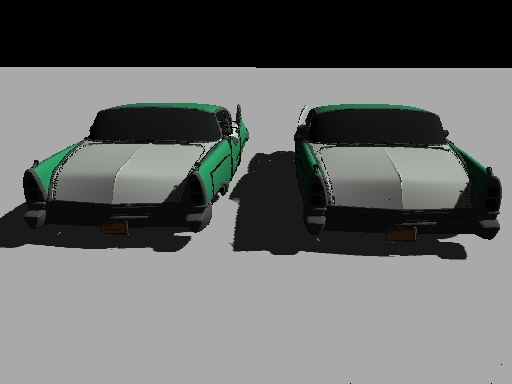 On the right, the reflection occlusion is enhanced by environment map lookups in the unoccluded directions -- done by passing an "environmentmap" parameter to the occlusion() function and using the resulting "environmentcolor" value. Most of the reflections are blue as the majority of the sky, but some reflection directions are facing more toward clouds and hence those reflections are whiter. Generally speaking, computing narrow reflection occlusion using the point-based occlusion approach is pushing the algorithm to the limits of what it was designed for. 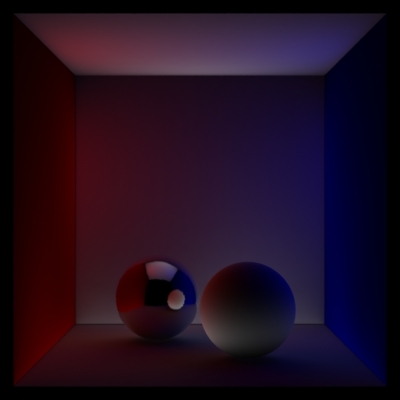 For very narrow cone angles, ray tracing remains the best method to compute reflection occlusion. As a rule of thumb, point-based reflection occlusion works best if the coneangle is at least 0.2 radians, and the occluding objects are not right next to the points where the occlusion is being computed. Computing approximate color bleeding is done in two steps: 1) generating a point cloud with area and color data; 2) rendering using the indirectdiffuse() function to compute point-based approximate color bleeding. Here is a RIB file showing an example. This scene is the infamous Cornell box with two spheres. The indirectdiffuse() function has a parameter called sortbleeding. (Clamp must be 1 for it to have any effect.) When sortbleeding is 1, the bleeding colors are sorted according to distance and composited correctly, i.e. nearby points block light from more distant points. This gives more correct colors and deeper (darker) shadows. When sortbleeding is 0, colors from each direction are mixed with no regard to their distance. 0 is the default. 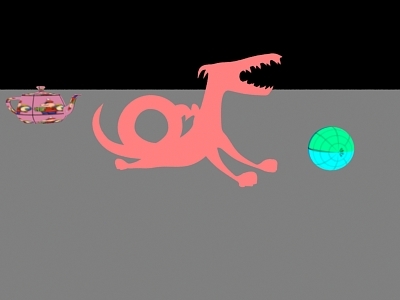 The shadows under the sphere are much darker in the image to the right due to "sortbleeding" being 1. 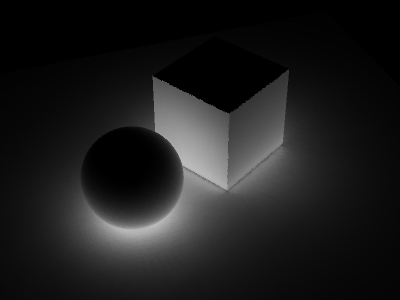 This example only shows the indirect illumination. 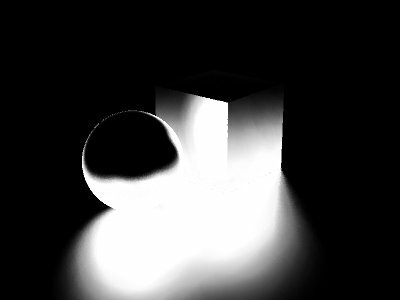 If the shader also computes the direct illumination, a full global illumination image can be rendered. 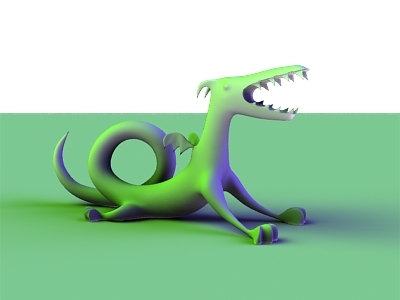 If the indirectdiffuse() function is passed a parameter called "occlusion" it will also compute point-based approximate ambient occlusion and assign it to that parameter. If the indirectdiffuse() function is passed a parameter called "environmentdir" it will compute an environment direction (average unoccluded direction, also known as "bent normal"). The computation of color bleeding can be combined with environment map illumination - just as for occlusion. Simply pass an "environmentmap" parameter to the indirectdiffuse() function. It is important to note that there is very little run-time increase from computing occlusion to computing color bleeding. This is in contrast to ray tracing, where the cost of evaluating shaders at the ray hit points is often considerable. The parameter "areachannel" can be used to specify the name of the channel (in the input point cloud) that contains area data. The default channel name is "_area". Similarly, the parameter "radiositychannel" can be used to specify the name of the channel with radiosity data. The default channel name is "_radiosity". In PRMan 15.2 the "hitsides" parameter was split into two for finer control: "colorhitsides" and "occlusionhitsides". The default for both is "both". Best results are obtained with "colorhitsides" "front" and "occlusionhitsides" "both". For backwards compatibility, the "hitsides" parameter sets both (and is also used for ray tracing). Generating this radiosity point cloud takes about three minutes on a standard PC, and computing (and rendering) the point-based color bleeding takes around 9 minutes. 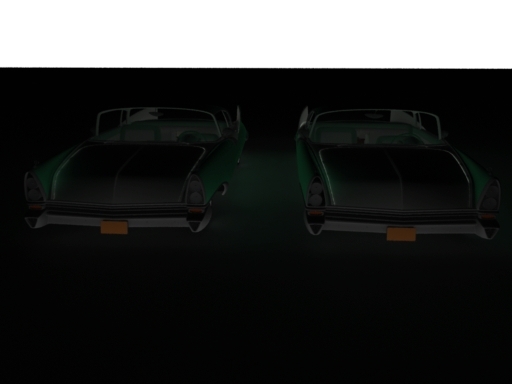 Notice the strong green color bleeding from the cars, and the gray color bleeding from the ground onto the cars. It is worth pointing out that the objects can have textures and displacement shaders without increasing the run-time for baking and rendering. Point-based computations can also be used to compute approximate glossy reflections. This is done by passing the indirectdiffuse() function a reflection direction and a fairly narrow cone. Computing glossy reflections this way is (nearly) as fast as reflection occlusion. Below is an example showing baking (left) and glossy reflection of the baked point cloud (right). Just as for the color bleeding case, the indirectdiffuse() can be passed an environment map parameter for glossy reflection calculations. The environment map colors will contribute color in directions with no baked points. Of course, since the reflected colors are baked, they may not have highlights in the right places. But the glossy reflections are so blurry that that oftentimes doesn't matter. Just as for reflection occlusion, point-based glossy reflections work best if the coneangle is at least 0.2 radians and the maxsolidangle value is small. We also recommend (in PRMan 15.0 and higher) to use a higher rasterresolution than the default 12. Illumination from area light sources can be computed as a special case of color bleeding. The first step is to bake a point cloud with colored points from the light source objects, and black points from the shadow caster objects. The light sources and shadow casters can be any type of geometry, which makes this approach very flexible - the geometry can even be displacement-mapped. The light source intensity can be constant or computed procedurally or using a texture. 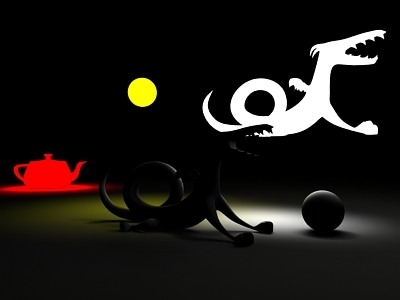 The following example shows three area light sources: a teapot, a sphere, and a dragon. 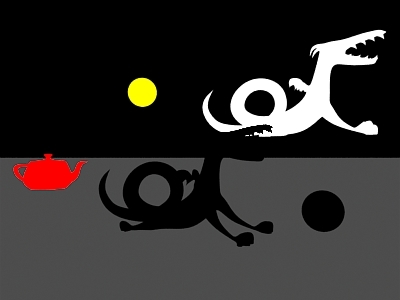 The area lights illuminate a scene with three objects: a dragon, a sphere, and a ground plane. Instead of rendering the occlusion and/or color bleeding, it can be useful to compute the data as a point cloud. This makes later reuse simple, and also makes it possible to generate a brick map (which has better caching properties than point clouds) of the data. reflectiondirchannel (string) is the optional name of a channel containing reflection directions - used to compute reflection occlusion (default is ""). ptfilter cannot currenly compute environment illumination. In this example there is only one file with areas and one file with positions; but each set of points can be specified by several point cloud files. If no position files are given, the point positions in the area point clouds are used. 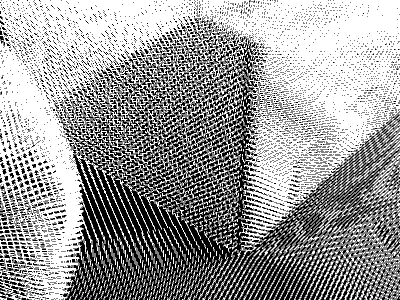 radiositychannel (string) is the name of the channel (in the input point cloud) with radiosity data. The default channel name is "_radiosity". colorsides [front|back|both] and occlusionsides [front|back|both] These are similar to the "colorhitsides" and "occlusionhitsides" parameters to indirectdiffuse(). The parameter -clamp reduces over-bleeding - just like it reduces over-occlusion. As for occlusion computations, there can be a separate set of point clouds specifying where to compute the colorbleeding. The data in the computed point cloud file are called "_occlusion" and "_indirectdiffuse" and optionally "_environmentdir". 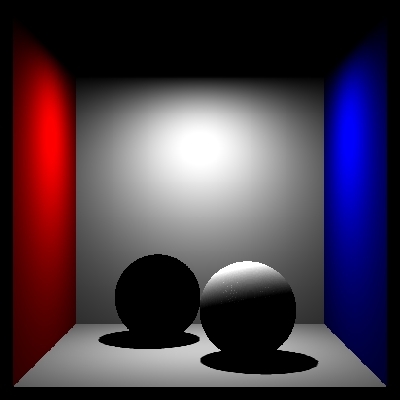 ptfilter can also compute soft illumination and shadows from area light sources. Simply bake a point cloud with brightly colored points at the area lights and black points at the shadow casters. Then run ptfilter -filter colorbleeding as in the previous section. Remember to set -clamp 1 and -sortbleeding 1 for best results. A limitation of standard point clouds is that the entire point cloud has to be read in by texture3d() and all the points stay in memory. In order to handle large point clouds more efficiently, PRMan 14.0 introduced a new file format: organized point cloud. An organized point cloud is a collection of points organized into an octree. The octree nodes can have additional data associated with them or not (depending on the application). For organized point clouds, texture3d() reads the points and octree nodes on demand, and cache them in a fixed-size cache. As described in the Baking 3D Textures application note, ptfilter -filter organize is used to generate an organized point cloud for use with texture3d(). To determine whether a point cloud file is organized or not, just run ptviewer -info foo.ptc or ptviewer -onlyinfo foo.ptc. The point cloud is organized if the listed number of tree nodes is larger than zero. The points in the organized point cloud contain the same data as the input point cloud but are sorted. In addition, each octree node contains a bounding box of the points in the octree node, as well as additional data. (For color bleeding, the additional data are the centroid and total area of the points in the node and spherical harmonics representing the directional variation of the emitted power and projected area of the points in the node.) This information is used by the subsurface(), occlusion(), and indirectdiffuse() functions during rendering. In fact, when this information has not been precomputed, computing it is the first thing these functions have to do. When precomputing the partial information for occlusion and color bleeding, it is important that the -sides parameter (front, back, or both) corresponds to the intended use in the shading functions (usually both for occlusion and front for color bleeding). All other parameters are ignored during partial evaluations. -partial 1 can be combined with -bounces values greater than 1. In this case, ptfilter will compute b-1 bounces and set up the points and octree nodes such that the indirectdiffuse() function can compute the last bounce efficiently. Cache statistics can be found in XML stats files under the heading point/octreeCache. The default cache sizes are 10MB (but no memory is allocated if the caches are not used). How to adjust the cache sizes is described in the cache sizes section of the Baking 3D Textures application note. The current implementation can give discontinuous, aliased results if "falloff" is set to 0 and "maxdist" is shorter than the scene extent. (The default for "maxdist" is 1e15.) With short "maxdist" values, please use falloff 1 or 2. If you must use "falloff" 0, setting "maxsolidangle" to a very small value can reduce the aliasing (but also increases render time significantly). If the computed occlusion or color bleeding is incorrect in a region of the scene, a good debugging method is to inspect the (area or radiosity) point cloud in that region using ptfilter in the disk or facet display mode. Is the disk representation of the surface a reasonable approximation of the original surface? 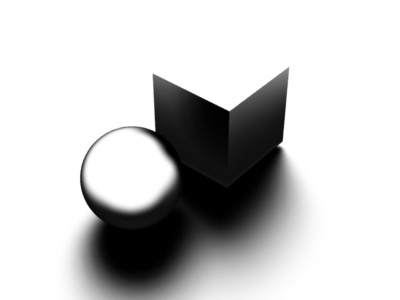 If not, the shading rate for baking that object may need to be reduced in order to generate more, smaller disks that represent the surface better. 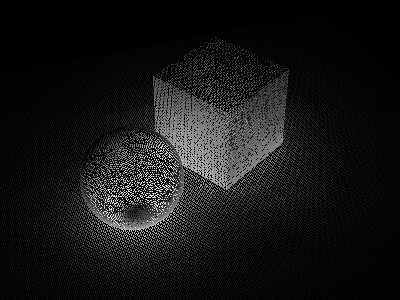 If the area/radiosity point cloud is not a decent approximation of the surfaces, the point-based method cannot compute good results. Some scenes are simply too complex to be ray-traced - storing all the geometry uses more memory than what is available on the computer. For such scenes, point-based occlusion may be the only viable way to compute occlusion. As mentioned earlier, the area point clouds can be sparser than the accuracy of the final rendering, so even ridiculously complex scenes can be handled. Another use of point-based occlusion is in a workflow that computes occlusion for each frame. Each frame is first rendered coarsely to generate a rather sparse area point cloud. 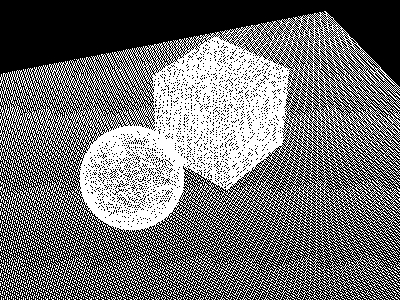 Then the frame is rendered with occlusion using the occlusion() function (with "pointbased" 1) at final resolution. The resulting image can be used as a 2D occlusion layer for compositing, and the point cloud can be deleted. Note that this workflow does not involve any point clouds or brick maps that have to be kept in the file system; the only result that is kept for later compositing is the full-frame occlusion-layer image. Per H. Christensen. "Point Clouds and Brick Maps for Movie Production". Chapter 8.4 in Markus Gross and Hanspeter Pfister, editors, Point-Based Graphics. May 2007. Per H. Christensen. "Point-Based Approximate Color Bleeding". Pixar Technical Memo #08-01. July 2008.